How do you turn a dream into reality? Easy. Become a fairy godmother. How do you become a fairy godmother? Easier. 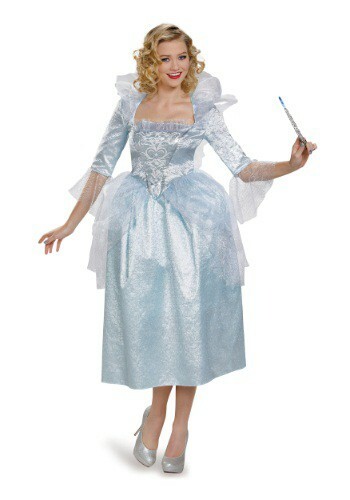 Wear this Women's Cinderella Fairy Godmother Costume. It’s as easy as bibbidi bobbidi boo! Once you slip into this enchanting outfit, you’ll look more than ready to make plenty of people’s dreams come true. It will take nothing more than a wave of your wand to make any wish come true. The magical wand, of course, is sold separately. We can’t legally sell or ship any magically enhanced objects. Although, we can help you get your hands on a prop wand. It may take a bit more than a wave of this replica to grant wishes but you will still look as charming as a storybook character. With this lovely outfit, you will look like one fairy godmother that is ready for a fairly formal gathering. Add a pair of high heels that matches the rest of your attire to step things up a bit. Then grab a sparkling tiara to top off this bewitching transformation. You’ll look so amazing with this ensemble even Cinderella will be making sure Prince Charming’s eyes aren’t wandering. Don’t worry about proving your magical abilities by changing mice into horses or pumpkins into a fancified coach. None of that will be necessary. As soon as others lay their eyes on this enchanting costume, they’ll all want to see you strut your stuff on the dance floor!